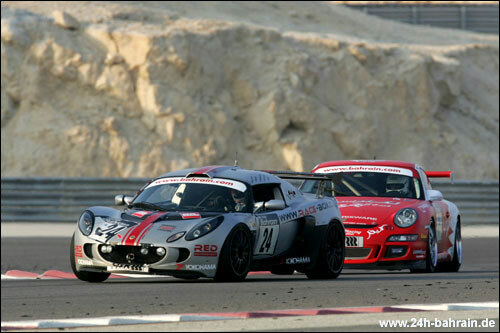 All was not well in the days and weeks leading up to the inaugural 24 hour race at the Bahrain International Circuit. In sharp contrast with the over-subscribed Dubai 24 hour event that will go ahead iin January ’07, the entry list for Bahrain was distinctly lacking in quantity. In the end the numbers had to be made up with locally prepared Chevrolet Luminas (which took the start but that was about it - until the finish), and teams were giving away drives at “Christmas Special” bargain rates. 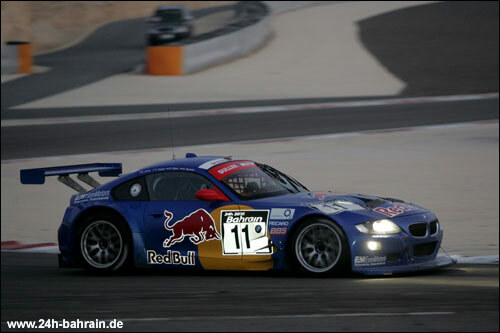 The quality was there, however, with the main interest coming from the German endurance and GT racing scene. 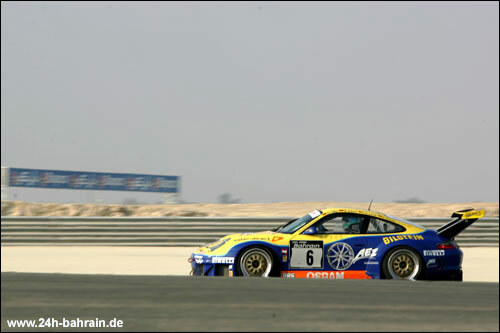 The Land Motorsport team looked the most competitive on paper, with a Porsche 996 GT3-RSR at its disposal, and five victories in the 2006 German Endurance Championship under the belt. In the Nürburgring 24 Hours, this team was on course for a podium finish when the Porsche’s engine let go in a big way with less than an hour to go. Joining Land’s regular driver Patrick Simon were Dirk Adorf, Christian Land and Hermann Tilke, the latter with one distinctive advantage over everyone else – intimate circuit knowledge, because he designed it. Walter Lechner sr., father of GT racers Walter Jr. (whose recovery from leukaemia is progressing nicely) and Robert, and a successful Porsche Cup team owner, fielded three cars in this event. Cup spec. 997s were entered for Richard Lietz / Christian Menzel / Klaus Graf / Thomas Jäger / Salman Bin Isa Al Khalifa and the local team Salman Bin Isa Al Khalifa / Fahad Al Musalam / Hamad Ahmad Al Fardan / Rashid Salman Al Khalifa, all of them members of Bahraini royalty. Austrian Supercup driver Richard Lietz won this year’s Monte Carlo Supercup race. In what he called the first endurance race since his karting days, Lietz was on the pace throughout practice and qualifying; he would not fare quite so well in the race itself. 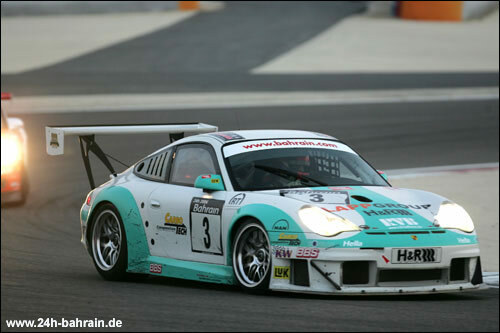 Thirdly, a 996 GT3-RSR in the familiar white-and-turquoise colour scheme of Konrad Motorsport was entered as a Lechner / Konrad co-production, in a comeback, of sorts, for Franz Konrad who has had an unusually quiet international season this year. Wolgang “Piranha” Kaufmann shared this car with fellow German Michael Schrey and Slovakia’s Miro Konopka. Leading the non-Porsche opposition were Joe Macari, Ben Aucott and Rob Wilson in the JMB Racing Ferrari 360, and Duller Motorsport’s BMW Z4M Coupé driven by (who else) Dieter Quester with Philipp Peter, Jarek Janis and Vincent Vosse. Land Motorsport occupied pole position thanks to superior engine power and a talented squad of drivers, with the Lechner 997 lined up alongside in row 1. Row 2 was made up of Tim (brother of Jörg) Bergmeister / Heinz-Josef “Juppi” Bermes / Stefan Rosina in the Mühlner Motorsport Porsche, this also a Cup car, and the Duller BMW in fourth spot. Land was in charge of the race throughout Friday (the race started at 14.00 local time on Friday), with the surprisingly quick Lechner Porsche giving chase. The chase came to an end after six hours when Richard Lietz ran out of road, and found the Mühlner Porsche that Bermes had spun into the gravel in exactly the same spot immediately before it. While the Mühlner car continued after a lengthy repair halt, the day was done for Lechner Porsche #1. The other Lechner car, too, had some trouble and later, to the delight of the locals, clawed its way back into the top 6. All this left the focus in the Lechner team firmly on Franz Konrad’s car. Land, meanwhile had to fend off the advances of the Duller BMW that came within 30 seconds of challenging for the lead - until the electronics acted up. This put the Konrad car in P2, and when the Land 996 threw a half-shaft around 2 am., the Konrad crew was there to pick up the lead, thank you very much. Behind them, two teams were now on a mission, with Land (above) and Duller refusing to give up their aspirations at victory in the inaugural 24 Hours of Bahrain. While the blue BMW showed some serious signs of fatigue later – the clutch cried “enough”, and a vibration got so severe that the instruments went to pieces - Simon and Adorf in the Land 996 consistently put in the fastest laps. Then, as so often is the case, the other halfshaft broke as well, which effectively put Land Motorsport out of the reckoning for the win; but they kept up their pace to at least get to the podium and take home a few trophies. The Konrad / Lechner cooperative meanwhile had troubles of their own: just as he exited pit lane, Michael Schrey found himself unable to disengage the pit lane speed limiter. A full lap at an agonising 60kph later, the team was able to rectify the problem, but their advantage had melted from eight to four laps. It proved to be enough, as their main adversaries were either nursing their car home (the Duller BMW), or too far back to mount a serious challenge (the JMB Ferrari). 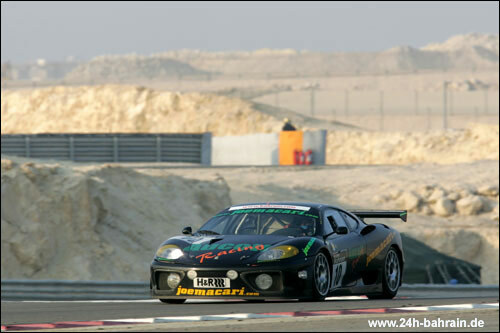 Franz Konrad, Walter Lechner and drivers Wolfgang Kaufmann / Miro Konopka / Michael Schrey are the first, and ideally not the last, winners of the 24 Hour Race of Bahrain. 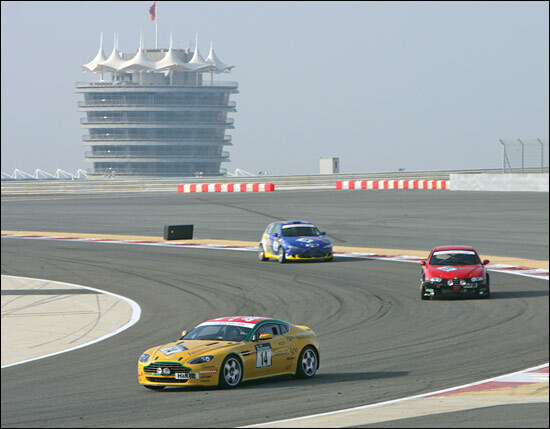 Aston Martin’s Chairman and Chief Executive, Dr Ulrich Bez, didn't actually appear in Bahrain (other commitments) but the big Vantage came home an impressive eighth overall, with no problems at all. “Once again we have proven the durability of a production standard V8 Vantage and the dedication and professionalism of the whole Aston Martin team,” said the absent Dr. Bez. As this event was run to German Endurance Championship regulations, there was also a diesel class, which saw a Battle Royal between Volkswagen and Alfa – mostly because there were no other cars entered. 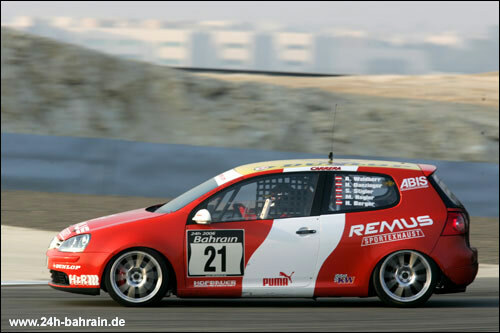 While Brunswick Automotive’s 147 JTD, with 1.9l turbodiesel engine, was unfortunately outgunned from the beginning, the German Alfa 147 entered by ORMS Racing is a 2.4l engined former ‘Ring 24 class winner, with about 260bhp. Their only opposition was a team of brand spanking new TDi Volkswagen Golfs built by the VW Austria Rally Team, with some (significant) assistance from the factory. They had the consistency, if not the reliability – the eventual class winner (#22, in 11th, #21 was 12th) lost a wheel three times during the event, luckily always in sight of pit lane; its sister car, driven by a crew of rally drivers some of whom had never been in a road race before, lost the class lead when a wheel excused itself from the race at the far end of the track. With the diesels comfortably able to go the full 2.5 hours maximum driver time on a single tank, they nearly broke into the Top 10, against machinery almost twice as powerful and probably twice as thirsty. The RED Lotus followed the VWs home, in 13th. A number of teams will leave their equipment in the Middle East over the holidays as they have also entered in the Dubai 24 Hours in mid-January, a race that will field a much wider variety of cars and should be at least as entertaining as the 24 Hour Race of Bahrain.